Please click on the links to the left to learn more about the type of services that we offer. We believe a good foundation is the key to optimal oral health, therefore, our periodontal care is of utmost priority. We customize cleanings to properly care for your specific periodontal (gums & bone) needs. Whether a six month checkup or full periodontal therapy, our hygienist will always strive to provide the very best treatment while maintaining your absolute comfort. Dentures, whether full or partial, are a removable solution for replacement of multiple or completely missing teeth. This type of treatment is a choice when there is not sufficient or available support for a fixed bridge. We pride ourselves in creating beautiful new smiles for many who did not expect to smile like themselves again. This process involves the close relationship between a general restorative dentist and a dental surgeon. The implant is a titanium cylinder like structure placed into the bone where the patient is in need of a restoration. Conventional treatment allows the implant to integrate (mesh) with the bone for a period of months before they are restored. A single implant can be used to replace one missing tooth or multiple implants can be used to replace several teeth. They can be used in conjunction with a permanent restoration such as a crown or a permanent bridge or a removal restoration such as a full or partial overdenture. Modern dentistry has allowed us the pleasure of combining beauty as well as strength when filling teeth. We take pride in "restoring" teeth as close to their original strength and appearance with composite resins and ceramics. Since patient comfort is top priority, our clinical staff and doctors go the extra mile to make a trip to the dentist a whole new positive experience. We offer Nitrous oxide, movies, music but most importantly good old TLC. The silver fillings in your teeth are actually a 50/50 mixture of silver particles and mercury, with trace amounts of other metals. Mercury is a potent poison that can cause severe and debilitating neurological disorders. It is accepted in the medical community that the mercury in existing fillings is not harmful because it chemically locked to the silver particles. Removing these fillings releases the mercury which can then be swallowed or inhaled by the patient if proper precautions are not taken. In our office, all silver filling removal is done under a rubber dam with high volume suction to eliminate the risk of mercury poisoning to the patient. This denture solution is ideal for the individual who wants that extra holding power of a denture. This denture has a plastic attachment embedded into the resin base that lines up with either a retained root from a tooth or an implant that has the reciprocation head of the attachment. This gives the denture a 'snap' when it is put in. No adhesive is necessary. The necessity for Root Canal Therapy can encompass many criteria. Typically treatment is needed because the tooth in question is painful, broken, decayed or infected so there is not sufficient tooth structure above the gumline to place a restoration. Treatment therapy typically takes 1-3 visits depending on the number, and anatomy of the root structure. Typically after a root canal is complete the tooth is in need of a restoration such as a crown. Crowns are restorations to restore a badly broken down or decayed tooth. This is not just a treatment for restorability it is also an esthetic correction. Whether it is the finest porcelain crown to repair years of wear on your front teeth giving you a movie star smile or the need to restore a broken down molar we are up for the challenge. There are a variety of materials used to construct these. By working with the finest laboratories in the country we are pleased to produce crowns that look and feel like your real teeth. When something is difficult, we usually say it's like pulling teeth—but in reality, tooth extraction is a routine procedure that helps prevent more serious dental problems. The most commonly needed extractions are usually wisdom teeth, but dentists may also remove a tooth if it's coming in at an angle, threatening the position of other healthy teeth or contributing to overcrowding in the mouth. In some cases, a broken tooth may also need to be extracted, as well as teeth with significant decay that cannot be treated by a root canal. Patients with advanced gum disease may be considered for an extraction as well. In the end, removing one potentially harmful tooth can often spare you hours of future treatment. To begin, you'll receive a local anesthetic to numb the tooth, jawbone and surrounding gums. Our skilled dentist or oral surgeon will begin to rock the tooth back and forth and rotate it to widen the socket for easier extraction. Because your pain receptors have been numbed, you'll sense some dull pressure during this process, but shouldn't feel any pain. 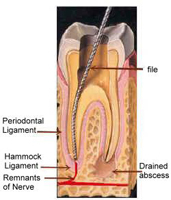 When the tooth is fully detached, we will remove it and cover the exposed gum with a small piece of gauze. Direct Bonded Resin veneers or Porcelain Laminate veneers are literally a "shell covering" placed over the teeth to enhance or correct their appearance. Whether used to close spaces, increase size, change color or straighten the teeth, veneers are one of the most exciting procedures we provide. With extensive experience and a true love for this type of work, we not only change peoples' smiles, our patients repeatedly say we change lives. If your teeth need a little extra help, you may have to wear head or neck gear with wires attached to your teeth. If you do have to wear headgear, don't panic! You probably will only have to wear it at night or when you're at home in the evening. Everyone has to wear braces for different lengths of time, but most people usually wear braces for about 2 years. You'll want to take special care of your teeth after the braces come off. You may need to wear a retainer, which is a small, hard piece of plastic with metal wires or a thin piece of plastic shaped like a mouth guard. Retainers make sure your teeth don't go wandering back to their original places. 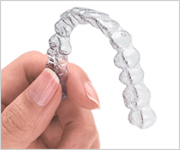 Your retainer will be specially molded to fit your newly straightened teeth. After you get your retainer, we will tell you when you have to wear it and how long—you might have to wear your retainer all day and all night for 2 years, you might have to wear it at night for 6 months, or you might have to wear it every other night for many years. It just depends on your teeth. And it's easy to get started. First, your doctor talks to you about your goals and examines your teeth to ensure they will benefit from the Invisalign system. He then writes a detailed treatment plan and orders a full set of customized aligners for you. Invisalign is also more convenient than traditional braces. Much more. (Compare them here.) The aligners are easily removable, so you choose when you wear them. You're free to take them out whenever you need to. Eating, drinking... you name it. Even if you just need a break from wearing your aligners during a high school reunion or special work event, that's OK. But remember, you need to wear your aligners as prescribed by your doctor in order to achieve your treatment goals. Invisalign aligners are made just for you with advanced 3-D computerized technology. Your clear aligners are custom-made for your teeth. And only your teeth. Little by little, and over a time determined between you and your dentist, your teeth will gently move to create the smile you've always wanted. For a dazzling smile, the clear choice is Invisalign. Insist on it. See your Invisalign-trained provider to see if it's right for you. And before you know it, you'll be smiling the way you want to.